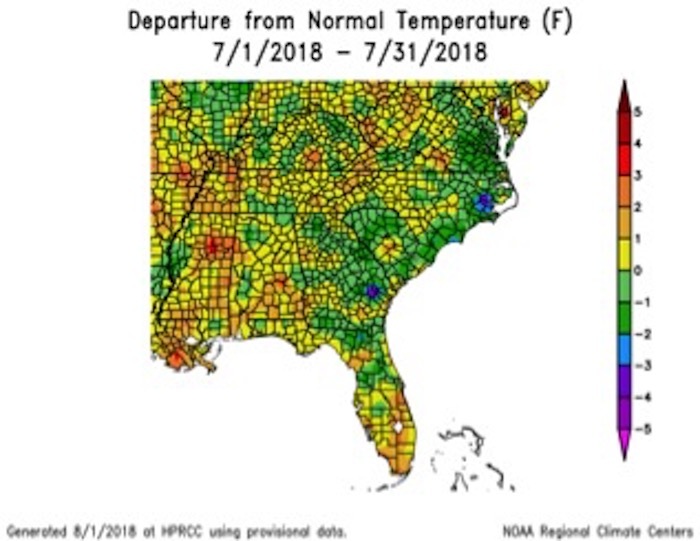 July saw the return of normal summertime temperatures to Georgia, but those normal summertime temperatures are still punishingly hot. Despite the heat, farmers were pleased with the rainfall amounts and say they expect very good harvests of crops like cotton, soybeans and peanuts. The heat and high humidity fueled scattered summer thunderstorms, and hail and strong winds caused some damage to fields scattered around the state. Brunswick, Georgia, saw the highest average monthly temperature: 83.3 degrees Fahrenheit, 0.05 of a degree above normal. Athens, Georgia, saw the lowest monthly average: 79.7 F, 0.9 of a degree above normal. No daily temperature records were set in July. Across the state, average temperatures ranged from 1 degree below normal to 1 degree above normal, depending on the area of the state. Albany, Georgia, had a monthly average of 82.9 F, 0.5 of a degree below normal. Alma, Georgia, had a monthly average of 83 F, 1 degree above normal. Atlanta had a monthly average of 80.8 F, 0.6 of a degree above normal. Augusta, Georgia, had a monthly average of 81.1 F, 0.5 of a degree above normal. Columbus, Georgia, had a monthly average of 82.4, 0.1 of a degree below normal. Macon, Georgia, had a monthly average of 81.3 F, 0.5 of a degree below normal. Savannah, Georgia, had a monthly average of 83 F, 0.4 of a degree above normal. Rome, Georgia, had a monthly average of 80.5 F, 0.9 of a degree above normal. Valdosta, Georgia, had a monthly average of 80.5 F, 0.9 of a degree below normal. Precipitation was scattered across the state in July. Atlanta saw the highest monthly total precipitation, according to National Weather Service reporting stations: 8.04 inches, 2.77 inches above normal. The lowest was in Augusta: 3.13 inches, 1.20 inches below normal. Athens received 4.98 inches, 0.51 of an inch above normal. Columbus received 5 inches, 0.24 of an inch above normal. Macon received 6.37 inches, 1.42 inches above normal. Savannah received 5.54 inches, 0.06 of an inch below normal. Alma received 6.15 inches, 0.82 of an inch above normal. Brunswick received 4.74 inches, 0.66 of an inch above normal. Valdosta received 7.52 inches, 0.89 of an inch above normal. Albany received 7.19 inches, 1.73 inches above normal. Rome received 3.22 inches, 1.10 inches below normal. Two precipitation records were set this month at National Weather Service stations. Atlanta reported a daily value of 3 inches in precipitation on July 14, breaking its old daily record of 2.77 inches, set in 1954. Alma reported 2.7 inches of precipitation on July 7, breaking its old record of 1.68 inches, set in 2000. Alma also reported that 2.5 inches of its July 7 total fell in one hour, the highest all-time one-hour rainfall total recorded in Alma in July. The highest daily rainfall total recorded by Community Collaborative Rain, Hail and Snow Network observers in July was 4.14 inches, which was recorded near Loganville, Georgia, in Gwinnett County on July 14. Two separate locations recorded 3.97 inches: one near Waynesboro, Georgia, in Burke County on July 27 and one west of Savannah in Chatham County on July 21. The highest monthly total recorded was 14.61 inches, which was measured near Darien, Georgia, in McIntosh County, followed by 14.30 inches and 13.84 inches measured by observers south and east of Savannah, respectively. Because of the adequate rainfall and cooler temperatures, no drought or abnormally dry conditions were reported in the state in July. High winds were reported on 15 days during July. Golf-ball-sized hail fell near Athens on July 21 and was accompanied by strong winds that toppled many trees in the area. On the same day, tennis-ball-sized hail was reported in Dacula, Georgia. A 2.5-inch hailstone was the second-largest hailstone observed in July in Georgia since records began in 1950. The Dacula hailstone tied with a 2.5-inch hailstone reported on July 14, 2004, in Blue Ridge, Georgia. The largest hailstone ever reported in Georgia was a 2.75-inch hailstone reported on July 20, 1998, in Austell, Georgia. An EF-1 tornado was observed on Oatland and Whitemarsh Islands near Savannah in Chatham County on July 27. A report is available from the National Weather Service: www.weather.gov/media/chs/events/ChathamCo_Tornado_Jul_2018/ChathamCountyGA_EF1_Tornado_07272018.pdf. The outlook for August and for August through October shows slightly enhanced chances for above-normal temperatures in most of the state through October and equal chances of above-, near- or below-normal temperatures in August. For more information, visit the Climate and Agriculture in the South East blog at site.extension.uga.edu/climate/ as well as Facebook at Southeast Ag Climate and on Twitter at @SE_AgClimate. Please feel free to email your weather and climate impacts on agriculture to share on the blog to pknox@uga.edu.